Will you buy a wardrobe for one of our kids? $50 will provide one child with a wardrobe, that's a full week's worth of school clothes. Will you help us provide one wardrobe, or two . . . or ten? If you would like to make a gift in honor of someone's birthday, anniversary, graduation or for any reason at all, we would love to accept your gift and send a note to the person you love sharing your kindness in their honor. For memorial gifts, we will notify a family member or individual as you request. A Clothes To Kids wardrobe is free to our shoppers. Clothes To Kids does not pass along any of our donations to other organizations. If donated items must be discarded due to condition or appropriateness the funds we receive from our textile recycler go towards the purchase of new socks and underwear. Any clothing items not suitable for school yet in good condition are made available to the family members of the shoppers on the day of their appointment. The cost for Clothes To Kids to provide a week's wardrobe of school clothing to an eligible student is only $50. 87% of expenditures go directly to program. Or said another way for every $1 you donate, $.87 goes directly to clothing a child! More than 73% of our funding comes from individuals. Clothes To Kids is 100% privately funded by individuals in our community, as well as businesses, organizations and private foundations. Want to talk with us about your donation? Call Jennifer Jacobs, Development Director at 727 441-5050 ext. 122 or email. Our annual report and financials have a lot of numbers. We are very happy to report them, and we are especially glad to tell you that we have now provided more than 135,000 wardrobes to low-income children, with a goal to deliver 11,000 wardrobes to school children in 2019, all free of charge. Would you like to review our Donor Bill of Rights? Would you like to see our Document Retention Policy? 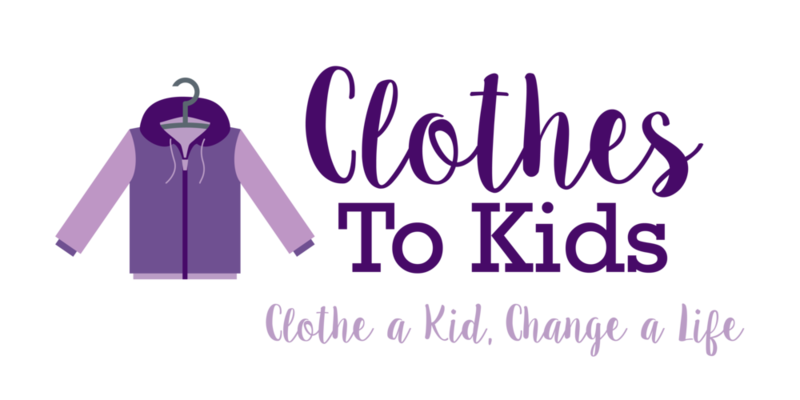 Clothes To Kids, Inc. Founded in 2003. A 501(c)(3) non-profit organization with store locations in Clearwater, St. Petersburg, and Tampa, Florida.